Teen artists are invited to submit a poster celebrating the 44th year of Art in the Park. All students who are enrolled in school within the Lakewood Public Schools geographic area are eligible, including those who attend public or private school and those who are home-schooled. Students must be at least 13 years old and no older than age 18 as of May1, 2018. The deadline for submitting artwork is May 1, 2018. One $100 grand prize will be awarded to the student with the winning design, and his or her artwork will be featured on the 2017 Art in the Park Visitor's Guide and on other Art in the Park promotional materials. $50 will be awarded to the student with the second-place entry. Contest winners will be announced in local print publications and introduced at Art in the Park on August 4, 2018. For complete rules and an application form, click HERE. Starting in January 2016, the Lake Odessa Area Arts Commission began holding painting classes for the general public, taught by resident artist and LOAAC board member Becky Stafford. Classes are held periodically throughout the year. 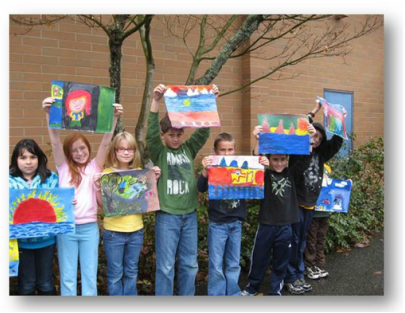 Each year the LOAAC sponsors an art show for Lake Odessa elementary school children, who create their own masterpieces for display during the annual Fall Festival in September.